This past Wednesday, the Supreme Court heard arguments on the constitutionality of the Trump Muslim ban. 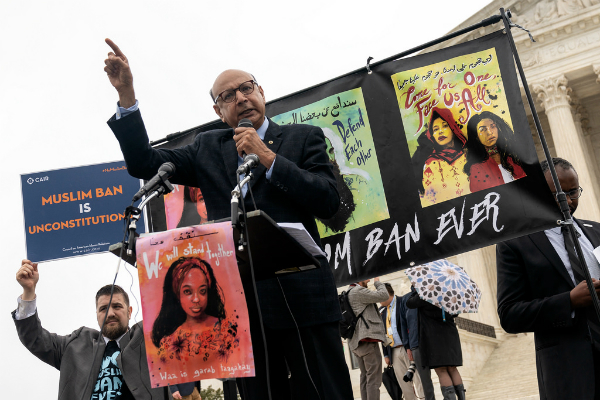 A diverse group of activists and advocates – many of them faith-inspired – was on hand to call for a decision that’s moral and constitutional. Interfaith Alliance President Rabbi Jack Moline was on the steps of the Supreme Court and gathered voices from the activists and advocates he met. Jack will also share his reflections and experience at the rally in support of Muslims, immigrants and refugees. Hear the full April 28, 2018 State of Belief Radio program here.